My child will not eat vegetables…is happily not something I get to say now! If you too struggle to get greens and other vital vegetables / vitamins and minerals into your children then I am hoping that the information in this post can help you. This method saved my dinner time meal problems bringing much joy It may not get a 10/10 for presentation but that really does not matter if your kids are actually eating foods like Spinach, Cabbage, Beetroot and other essential veg! Its proven in the abundance of common knowledge and nutritional information out there that we need our veg and more importantly our dark leafy greens to obtain the nutrients needed to live strong but with so many sugar / artificial additive infused foods so readily available and highly promoted its easy to see why our kids opt for those and say nah to the veg. Albeit I wasn’t about to give up on trying and I certainly wasn’t turning back. After the marvelous discovery of potato cakes I found an even simpler way to achieve this goal. It comes in the form of a richly flavoursome mash! Genius! I didn’t attempt it before as until the legendary potato cakes my boys wouldn’t eat mash but now they call for man sized portions at least twice a week. The good thing with this way of cooking is not only can it all be done in 1 pot (if you have one large enough), each time different vegetables can be used and your heart can be filled with contentment knowing your child is eating so much needed goodness, the bonus is they will truly love it and they wont even know they are eating veg, cheeky mum! This method stands strong for adding all sorts of ingredients you want your children eating, as in the potato cakes, Moringa Leaf powder is used, I have also used a Hemp version just with the potatoes before and it worked well. I no longer use eggs for the cakes instead I use a baking powder mix. Both the cakes and the mash are excellent ways to ensure optimum health reaches children. I have adapted the mash base for adding any vegetables or powders to and it has never failed with my children. The base ingredients are Potatoes, Onions, Garlic and butter. The garlic and onions give such an inviting aroma and taste that the kids don’t notice the other vegetables that are added. Adding some coconut oil in place of dairy butter and almond milk (recipe available at https://peacecrafting.wordpress.com/2014/08/01/homemade-almond-milk-with-a-roar/ – enjoy) can really cream things up too, it boosts calcium intake as well as saving the cows! The method is so simple, boil / steam the potatoes with or without the other selected ingredients in the same pot. Mash the potato. Then use a blender to really mash up all the other veg (use a little cool water in the blender to get it mixing), combine the lot, allow it to cool and serve. Problem solved! You can then add eggs or flour and proceed to bake in the oven to crisp the top. My children love it both ways! Get in! I can understand this may not be a suitable way for your family to cook or eat due to allergies or lack of a blender but please do not worry as our friends at Nature’s Plus have devised a beautiful range of vegan, gluten and sugar free vitamin / mineral animal shaped energy supplements (the kids really think they are sweets and in truthfulness they are, the healthiest ones out there! ), they are a real hit. The ones we use are Animal Parade. They are assorted flavours and they are a multi – vitamin and mineral giving an all round boost containing vital nutrients difficult to obtain. They are superbly crafted and the detailing is perfect, the boys love picking which animals to have for the day and the colours add variety, they are naturally sweet smelling and tasting from the fruit and many of the ingredients are over 100% of the RDA (recommended daily allowance). If your child is really fussy or just will not eat, giving him 2 of these a day will settle your nerves as you know he’s getting some goodness and it will keep him going with healthy body and healthy mind. Please let me know how these methods go for you by commenting below or sending an email to peacecrafting@outlook.com. Equipment: Leaves, Paper and Drawing colours. 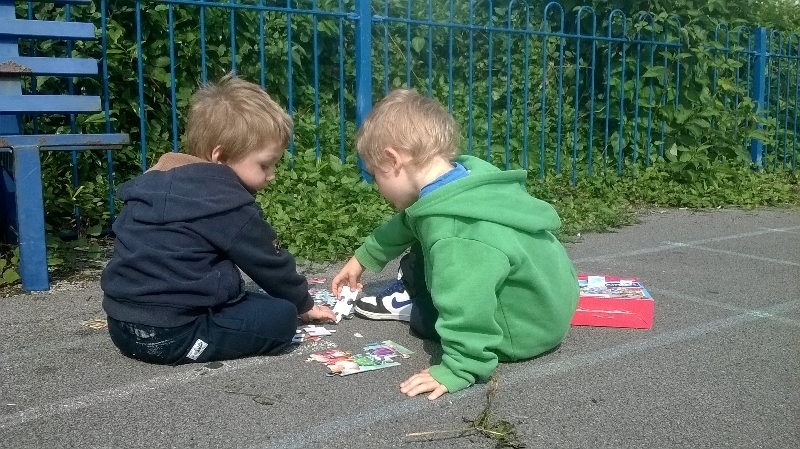 Get set out into Nature and discover the wonder of leaves, collect many inspiring leaves, get out your favourite colouring / drawing pens and pencils and draw your own leaves on paper. Place the leaf under the paper and trace over the beautiful structure to grab ever detail or press the leaf on the top of the paper and follow the outline around the edges then fill in the rest studying the leaf as you go. As Summer fades and Autumn graces us we are shown the true beauty of the colours in our lives. Through the changing leaves we feel Autumn’s approach. A friend gifted the idea of a leaf drawing activity that sounded like a fabulous idea. Boys set to go, we headed out the back to the peaceful walk way, along which we found various eye catching leaves. My children are still very young and at first did not quite understand why Mummy kept stopping and picking up bits of nature. After a few stops my youngest jumped off the trike, picked up some leaves and placed them in the pot then he helped me close the lid (so sweet!) and hopped back onto the back of the trike. We then came to our little woodsy area where we admired the trees and their amazing heights. 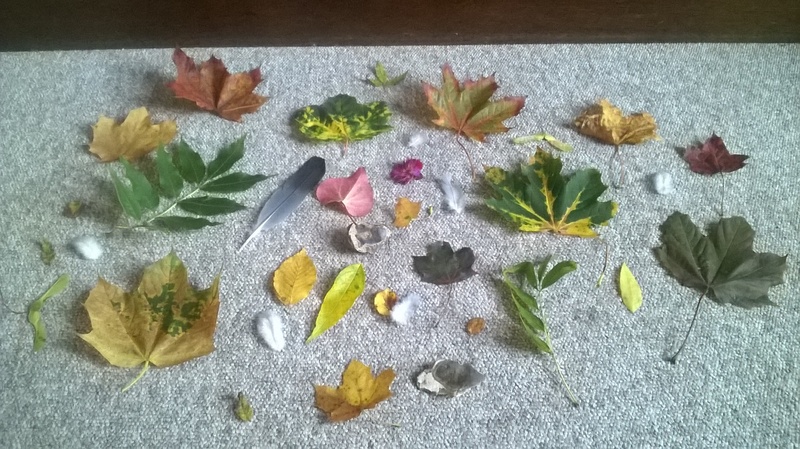 Here we found more beautiful leaves, some fluffy little feathers and some cool looking rocks which we gathered and added to our collection. Leaving the woods we crossed the basketball courts and playing fields and released some energy in the park. After loads of spinning and giggles with the other children there we headed over to the skate park and swapped rides with the bigger kids and had fun racing the ramps and trying new tricks. I was approached by a young boy; let’s call him Harry for namesake, who brought to me a leather bracelet he had found, it had a sharks tooth on it and I told him it was lucky and he was blessed to have found it, he said he wanted to keep it so I asked him to look after it and as it was broken I offered to help him make something else from it. He chose the pieces he wanted to keep and we rearranged it to make a new style bracelet, we tied it on his wrist and he felt super-awesome to have a shark tooth! The boys continued playing and I had a little time to research the background of Vinegar which did prove very interesting. After a second time in the park then some yummy figs, I realised that time really does fly when you’re having fun and bidding farewell to the other children we headed home for lunch where we put up our nature collection and enjoyed ‘Green Banana’ spread recipe on our brown rice loaf which went splendidly with the Quinoa freshly made earlier in the morning. Later in the afternoon I set up an area for the leaf art, had a little practise for myself and encouraged the children to see what magic can be created with the leaves we had gathered. Unfortunately the eldest one was not all that impressed by the ‘leaf drawing’ plan for the day and when it came to the drawing he really was not feeling it, perhaps it was as we ran late for lunch and should have attempted it as soon as we got back, although I will say he didn’t collect a single leaf 😦 who knows…we all have bad days, right? Nevertheless I proceeded in demonstrating how to trace over the leaves, they did both have a go and could see the results. We then drew around the leaves and Mummy began drawing and colouring a leaf to which my youngest bobbed his way in and took over that plan! Yummy! You may not think it would taste so considering its 50% straight Moringa Leaf powder but trust me when I say it is. If you have been following my blog you will know all about me and bananas alas, today I was contained and did not go ‘bananas’! The kids adore this type of fruit and I have cut the amount they were consuming down after seeing the men on the river and how many they are actually able to carry back in their boats. The boats don’t house much space and the amount of bananas per 1 boat is very limited, this brought compassion within me to cut down the 3 bananas they were eating per day! I love the thought of getting the maximum daily nutrients required into my Sons and think Moringa Leaf is a great way to aid towards that. It is known as the Tree of Life, it’s absolutely packed with various nutrients and minerals and a follow up post especially dedicated to this tree will give a more in-depth insight into the true values. I know from experience the health benefits that 1 teaspoon a day can bring from a motivated morning to strong nails and beyond. It’s so packed with nutrients that I strive to get it in our diets wherever I can. Usually we use crushed berries on our bread but today we got creative and made Banana fruit spread with a twist of Moringa Leaf powder. I was a little dubious at first as the powder can bring quite an overpowering taste although here it didn’t and it just tasted marvellous! My youngest boy ate his entire portion straight up whereas my eldest was a little more cautious and began by dipping his finger in the spread to then scooping it off with a spoon (guess he loves the flatbread)! This spread was an all-round family winner and one that will definitely be made more often as great way to ensure optimum health in my children and as a funky way to change up the way bananas are eaten! Based on 2 children for 1 meal. Peel and slice banana, mix it in a bowl with a fork. Using a teaspoon (5g) add the desired amount of powder and blend. Spread on bread of all kinds or add to your favourite foods! Getting in a ‘bath’ filled with hot water was one of the best decisions I have ever made during labour giving birth to my second child. I was lucky enough to be in the hands of a local midwife unit and that of two sincerely caring women. After my first Son’s entrance to the world I knew I had to do things differently bringing my next in so I opted out of conventional hospital care and went to something on a more personal level. A home birth was not a safe option for me at the time although if I ever do have another child I should very much love that. The care I was shown at The Grange Community Hospital in Petersfield, Hampshire was exceptional and I would highly recommend it to everyone expecting a baby. I hadn’t really considered the birthing pool (bath) as an option prior to being in labour but luckily enough for me I had the entire midwife unit to myself and the room I was in had one already in. This time around I truly wanted a natural birth but even after you’ve done it once it is still scary and still really hurts so I did accept the gas and air offered. When the contractions over rid the help from the pain relief and I began to really ‘feel it’ the midwives offered me the option of the birthing pool. I had always been put off by the idea of a water birth as it didn’t seem natural to me as my baby would not be able to breathe under the water or swim! The women explained to me I didn’t have to actually give birth in the bath and could get in and out as I pleased and that is certainly exactly what I did. Upon first entering and sitting down in the water I honestly instantly felt a major relief, it was amazing, it was almost as if the pain totally stopped. When the contractions did become noticeable again the pain had decreased back to how it was when they first started, easily 10x less than before i got in, I could not believe how much it truly helped. Seriously. After a while of being in there I did start to feel uncomfortable (mainly due to the thought of my baby being underwater) and decided to hop out for a bit, realising the difference in the pain it was not long before I re-entered! Again, submerging into the heated water instantly helped and i stayed in there until my baby was ready to be born. It was so beautiful compared to my first birth, I could feel everything and could sense when he was going to come. I knew he was coming, alerted the nurses and they suggested I allow him to be born in the water…no way was that happening, I jumped straight out, got water everywhere and before I knew it I was holding my second child in my arms after less than 6 hours of very hard labour. It was the most beautiful experience of my life and I cannot thank the midwives enough for the true loving dedication they showed me. The personal care was astounding, they helped me through every breath, every push and guided me so well as to avoid tearing as previously I’d had to have around 20 stitches after a traumatizing 36 hour labour with my first Son. The aftercare given was precisely what I needed and shortly after I got to go home which was a huge relief! I’m so glad I took the advice from the midwives to get in the water and I will forever recommend it for everyone. To my dream reader seeking a better day. To the person that truly feels there’s something missing and hidden in their lives, our culture. To those that know something must change in this world for humans to progress and ascend. Seeking the truth and understanding that the information we are given by our so called leaders is not all that is out there. The information we are being fed is not really beneficial to our health and if you look deeper you will find a more righteous way to live. You can covert your lifestyle to one that makes you feel more at home within yourself. What really makes you happy. What do you feel you should do? You sense something is wrong so make changes. Find a little more about how I feel here. Follow your beliefs and delve deep into knowledge and tap into wisdom. I think nature is my favourite topic for photography, the stillness and the movement create a perfect scene for amazing photographs. Being at one with nature and using patience can really gain some great shots. Here are a few of my recent photos of nature around me. Lets go find out who’s under that log! Snacks and water bottles packed. The children loved the idea of gearing up the trike and setting off for the woods to discover what creatures we could find! Gliding down the path, sides alive with trees we make it to the mini forest. Wow! What will we find? We carefully lifted up our first log, placing it down with care and underneath was a family of four brown Slugs snuggling together and two separate orange Slugs near by. Also under this log we found a few fast woodlice crawling about. To the side of our first log we found an empty Snail shell. Snails are a favourite friend in our house and learning about why we found a shell with nobody inside gave further understanding of the beautiful species. A lot of critters made a move for it when we lifted the log. We studied what we had and replaced the log gently. There wasn’t much under the next log we lifted although after we put it back we identified some moss growing over and encasing a stone. We identified that the stone is a non living factor (abiotic) in the eco system and that the moss is a living factor (biotic). We also found some feathers and the children enjoyed the shades and textures. We then looked at bark from a fell tree and learned why it had been cut down. We also learnt not to hit the living trees and that the deadwood is better for making sounds with sticks. We created some drumming noises on the sleeping tree and gave a big hug to the living one. With the sticks we already had, we gathered up some more and played a counting game with them. There was lots to collect and pile up. Numbers in nature. Moving along the trail we encountered a captivating arch of Ivy that had wrapped itself over a bending tree. As we approached it my Son found there was a Blackberry bush next to it. My children love berries especially ones they can pick for themselves and luckily enough they could reach the good ones. After this we stopped at a huge sleeping tree and perched upon its comfy surface for a bite to eat. When we had finished eating we cleaned up and moved off in the direction of the connecting field. Through the woods we saw some more trees, we found some that were odd shapes and also some that we noted as very tall trees compared to the rest. We payed attention to the parts of the trees and that leaves and branches sway with the wind. Upon reaching the field the next thing we discovered was an old favourite in Dandelion clocks, the children enjoyed blowing the seeds into the wind so they can grow into flowers. There are so many things to learn about on a trip to the woods if you approach with care, respect and love, stopping to take in the beauty of all that is. Tomorrow is promised to no one. Living in the here and now is to be able to let things go and to not worry. To get things done that need doing. To achieve the important goals that keep your life in health, physical and mental. Too many people spend too much of their lives in an unnecessary state of stress concentrating on what may happen, instead of thinking about what they can do to create joy in this present moment. It is actually all we ever have. Stressing over something surely only focuses you in negative energy thus creating negative outcomes…a negative life. Is the situation really that bad, more importantly can you do anything about what you are worrying about? No?…then all you can do is let it go and choose to be happy. Lucky you! You have that choice. Everytime it creeps up just understand you cannot change anything and get back to the things that need doing, dismiss the stress and worry and focus. You can naturally learn how to just put it to one side and let it go. It’s great! Holding onto the state of being in the present constantly, in the now, I feel would be an extremely beautiful life. Being able to be at peace is beautiful if only for a minute and may be achievable by everyone. Believing you can live this way is the first step to freeing your mind. Taking a short while early in the morning to just be and not to think really clears the mind for the day allowing thinking to flow calmer. I am a very busy bee with children that certainly keep me on my toes, I don’t get much time to myself and I find setting up the day with a main structure helps to keep the flow going steady, to anchor in the now and remember to do all that can be done. By ensuring you know the root and cause of the stress and exploring any possible changes you can make first, you will understand that nothing more can be done. You have done all you can. What else can you do? You can focus on the work at hand. Doing all tasks and following all ideas that arise within you instead of leaving them until ‘later’ generates you feeling happier overall. Following the voice within, the guidance, your Soul at its moment of inspiration shows you that’s how you really get things done, that’s living a life, when you look back. Like all great things patience is required to see this for fact although it does make sense. Procrastinating only proves to clog up space within you that can be used for creativity. Leaving things too long can actually lead to being very unhealthy, it can create an unpleasant cycle. You don’t do the thing that needs to be done so you resent it then because you resent it you just leave it to then feel negatively towards next time it pops up. If you do things spontaneously or as they need to be done, the to do list gets quickly ticked and before you know it you’ve had another great day! You instantly feel a satisfaction of achievement knowing its done and can live better in the moments of peace that are gifted. You may notice the effects of your more conscious decisions straight away, the effects are certainly noticeable over a few months of really making the effort to do everything there and then. Looking back it is evident that more time is spent in joy when these ‘little things’ aren’t lingering in the mind somewhere. Again leaving the mind freer and for feeling good vibes. Focus is maintained through construction of structure. Organisation. Focusing on the now and being free from worry naturally dismisses bad vibes and less negative situations occur, if negativity does arise the capability to deal with it is enhanced. After a while of choosing to be positive its clearly evident less negativity surrounds you in general. Less is naturally drawn to you. Positivity and inner warmth fill the Soul. Choosing kind and positive thoughts, truly leaves you with more joy and allows you to connect with other like minded people, filling our world with love.